Security plays a very important role in making any software enterprise ready. Linux has a robust security architecture yet it allows plug-gable module to connect to any external Identity manager for authenticating and authorizing users. Using the nss_ldap shared library it is possible to implement the maps above using LDAP, anyway here I’ll focus only on the LDAP implementation of shadow, passwd and group database tough all the maps above can be implemented. For most of the other maps it is even unadvisable to store them in ldap, as they tend not to change too often, so it is not a problem to have them locally as files, and storing them in ldap would cause some minor performance loss. 1. NSS can lookup the local configs of /etc/groups, /etc/passwd for user , uid, group, gid mappings or it can lookup to LDAP to do the same. 2. PAM can lookup /etc/passwd for retrieving the username and password for authentication of lookup a third source. 3. As both modules can talk to external source, what it means is there can uid and gid visisble on the Linux which are not present in local confs of /etc/passwd, /etc/groups. 4. This provides an ability to manage all users, groups and password on LDAP, and both PAM and NSS pointing to LDAP (remote source). 5. On the OS all the uid and gid visible are  being fetched from LDAP and have no presence in the local configs. 7. This provides an opportunity to maintain all the users and groups on LDAP and not locally on the machine. 8. Do remeber both PAM and NSS will have a logic to resolve names as in a uid is present in /etc/passwd , git in /etc/groups and with same uid on LDAP , based on the config the conflict will be resolved. Generally the local config wins over the remote sorurce. 9. An application can make a call to LDAP independently too, there is no restriction to always go through PAM , NSS for reaching out to LDAP. As users are maintained in a remote Service, making lookups every time becomes expensive . PAM and NSS evntually started becoming very complex hence tools like SSSD, VASD came into being. The sssd daemon (Running locally on the Linux OS) acts as the spider in the web, controlling the login process and more. The login program communicates with the configured pam and nss modules, which in this case are provided by the SSSD package. These modules communicate with the corresponding SSSD responders, which in turn talk to the SSSD Monitor. SSSD looks up the user in the LDAP directory, then contacts the Kerberos KDC for authentication and to aquire tickets. Of course, a lot of this depends on how SSSD has been configured; there lots of different scenarios. 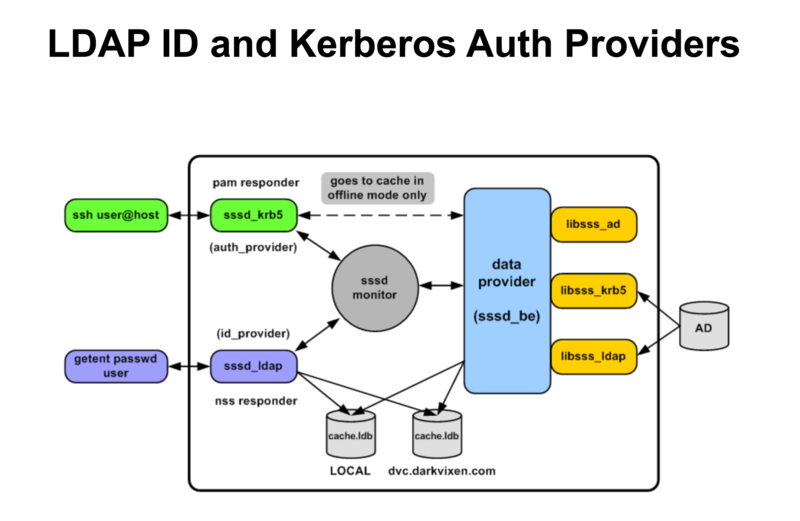 For example, you can configure SSSD to do authentication directly with LDAP, or authenticate via Kerberos. 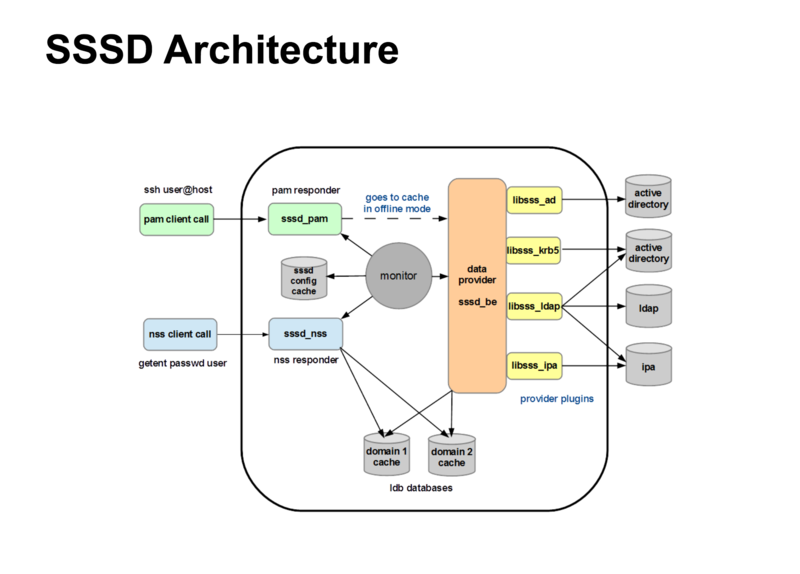 The sssd daemon does not actually do much that cannot be done with a system that has been “assembled by hand”, but has the advantage that it handles everything in a centralised place. Another important benefit of SSSD is that it caches the credentials, which eases the load on servers and makes it possible to go offline and still login. This way you don’t need a local account on the machine for offline authentication. In a nutshell SSSD is able to provide what nss_ldap, pam_ldap, and pam_krb, and ncsd used to provide in a seamless way. Lets look at who PAM, NSS integrates with SSD. 1. PAM, NSS and SSSD/VASD are present locally on your Linux OS. 2. Any call made to OS for authenticating or authorization results in a call go PAM/NSS eventually to SSD and eventually to AD or LDAP. 3. SSD can integrate with LDAP, AD, KDC . 4. Three layers are completely transparent to the OS applications. 5. SSSD/VASD maintains a cache locally on the OS. 6. SSSD/VASD will lookup both in the external source and locally to  get user -> password or user name to -> uid , uid-> username, group name to gid, gid-> group name etc.